The chemistry of carbon molecules leading to the formation of large carbon-bearing molecules and dust in the interior of an expanding supernova is explored and the equations governing their abundances are solved. A steady state between production and destruction is set up early and evolves adiabatically as the supernova evolves. Simple solutions for that steady state limit yield the abundance of each linear carbon molecule and its dependence on the C/O atomic ratio in the gas. Carbon dust condenses from initially gaseous C and O atoms because Compton electrons produced by the radioactivity cause dissociation of the CO molecules, which would otherwise form and limit the supply of C atoms. 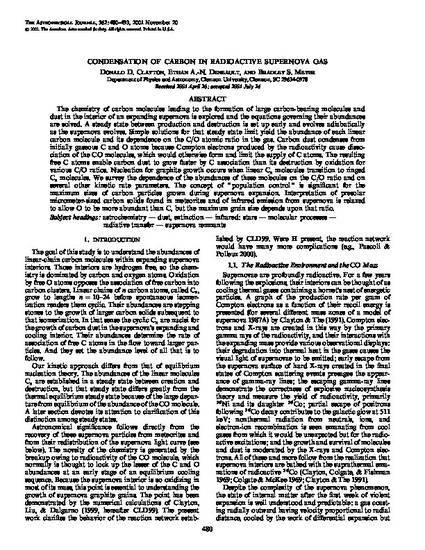 The resulting free C atoms enable carbon dust to grow faster by C association than its destruction by oxidation for various C/O ratios. Nucleation for graphite growth occurs when linear Cn molecules transition to ringed Cn molecules. We survey the dependence of the abundances of these molecules on the C/O ratio and on several other kinetic rate parameters. The concept of "population control" is significant for the maximum sizes of carbon particles grown during supernova expansion. Interpretation of presolar micrometer-sized carbon solids found in meteorites and of infrared emission from supernova is relaxed to allow O to be more abundant than C, but the maximum grain size depends upon that ratio.